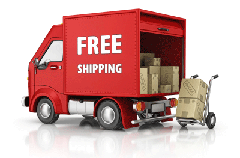 Free Shipping*, No Fees, No Stress. Guaranteed. We will ship your fitted slip-over seat covers to Canada and the continental USA for free. We do not ship across borders so you will have no additional brokerage, duty or delivery fees. Canadian orders ship directly from Canada, US orders ship directly from our outlet in the USA ! !